Listen to the music of Ayala and Malka Ingedashet, two Israeli Ethiopian vocalist and sisters who join the ranks of Jill Scott, Erykah Badu, India Arie, and Macy Gray. 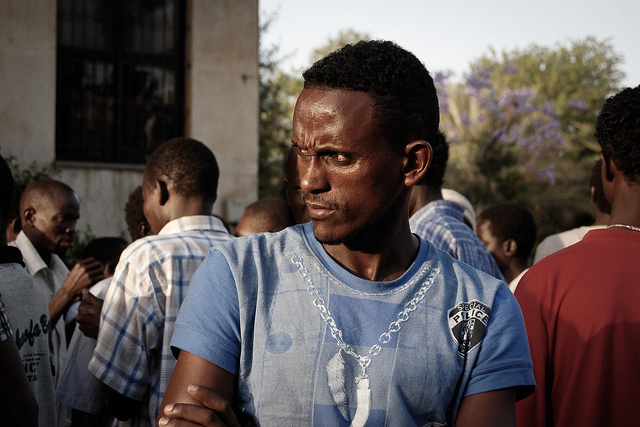 JERUSALEM, Israel - The Israeli plan to send its over 60,000 African migrants to an unidentified third country has received elicit criticism for the potential harm to the migrants. Over the past eight years, thousands of African migrants, mostly from Eritrea or Sudan, have entered Israel through Egypt. Some of these migrants were fleeing repressive regimes or seeking job opportunities. Israel has attempted to stop the influx of migrants by building a fence on the Israeli-Egyptian border. Additionally, since last summer, Israel has been imprisoning new arrivals in order to determine if they meet the criteria for refugee status. Israel also offered cash to migrants if they would leave the country voluntarily. The Washington Post and the Associated Press allude that many Israelis feel some sort of “natural responsibility” toward the migrants from Africa because of the Holocaust. However, other Israelis worry that Israel’s Jewish character will be threatened with the arrival of the migrants. Fears for the migrants safety from mistreatment in the third country sparked criticism toward Israel’s plan. Israel has yet to announce the details of the plan and the country they plan to send the migrants to. According to the Washington Post, court documents show that Israel has an agreement with one country to take on some migrants, and is currently in talks with two others. It is not known what these countries would receive in return. Under the 1951 Convention Relating to the Status of Refugees, states cannot send refugees to countries where they will face physical or political danger reports the Associated Press. It is unclear if Israel will be monitoring the well being of the migrants when in another country. A quick update of the recent rulings on women’s rights in the Gaza Strip and Saudi Arabia. GAZA STRIP, Israel - Gaza’s Hamas-controlled parliament passed a law requiring separate classes in schools for boys and girls in public and private schools from the fourth grade, Aljazeera reports. Osama Mazini, the Hamas education director, announced on Monday that the February 10th law was approved by parliament. Article 46 bans “the mixing of students from the two sexes in educational establishments after the age of nine, and work to 'feminise' girls' schools." The law also bans males from teaching in girls’ schools. In the past, Hamas has enforced conservative religious laws, such as telling school girls to wear traditional full-length robes and headscarves in a besieged territory. Hamas, the Islamic Resistance Movement, is the Palestinian Sunni Islamic or Islamist organization. The group was founded in 1987 during the First Intifada as an offshoot of the Egyptian Muslim Brotherhood. Hamas’ original purpose was to liberate Palestine from Israeli control and to establish an Islamic state in the area of Israel, the West Bank, and the Gaza Strip. Hamas took control of the Gaza Strip in 2007 when it won in a landslide against its opponents, Fatah. In July 2009, Hamas’ political bureau Chief announced that they would settle for a resolution of a Palestinian state based on the 1957 borders so long as Palestinian refugees had the right to return to Israel and that East Jerusalem would be the new nation’s capital. The traditional Muslim organization’s Article 46 forbids the "receipt of gifts or aid aimed at normalising (relations) with the Zionist occupation (Israel)." Article 46 will go into effect in September. Saudi women can now legally bike in public under certain conditions, Aljazeera reports. The Saudi Arabia’s Commission for the Promotion of Virtue and the Prevention of Vice overturned the previous ban on cycling and motorbiking for women. However, women must wear a full-body abaya, be accompanied by a male relative, and stay within certain areas. Women are allowed to ride bikes for recreation purposes only. WEST BANK, Israel - The Israeli government announced today that it is introducing two segregated bus line in the occupied West Bank. Aljazeera reports that the Transport Ministry in Israel called this move “an improvement in service.” The Transport Ministry also said that the new bus lines would “improve public transport services for Palestinian workers entering Israel,” and save Palestinians from being charged “exorbitant prices” by pirate buses. For any of those unfamiliar with the Israeli/Palestinian conflict, the Israelis and Palestinians are currently engaged in a conflict over land rights. The “start date” of the conflict is argued heavily among scholars. Both groups have historical, cultural, and religious claims upon the land the Arabs and Jews are fighting over. The following is an abbreviated history of the recent Israeli/Palestinian conflict; however, in the interest of expediency several major events have been omitted. The Balfour Declaration of 1917 by British Foreign Secretary Aruther James Balfour in a letter to the Zionist Federation’s President Lord Rothschild, declared that British would “view with favor the establishment in Palestine of a national Jewish peoples.” There have been several other papers and agreements that altered British support of the Jewish peoples, such as the White Papers of 1922 by Winston Churchill. Eventually, British handed the problem of Israel/Palestine to the United Nations (UN) in 1947. The UN implemented a plan to partition the British Mandate of Palestine into two separate states with “a special international regime for the city of Jerusalem.” Through the Camp David Accords, Israel agreed to give Palestinians more autonomy in the Gaza Strip and the West Bank. Currently, Palestinians mostly occupy the West Bank and the Gaza strip, while Israelis occupy the rest of the territory. However, throughout the entire country, there are communities of Jews and Palestinians littered throughout the territory. Both groups are currently vying for international sympathy in order to justify their claims toward the entire territory of the current Israel/Palestine. This recent event currently sways some sympathy toward the plight of the Palestinians. According to the Guardian, the buses will run from the Eyal checkpoint by Qalqiliya across the border of the West Bank toward Tel Aviv. For passengers who have been granted permits by the army to enter Israel, they can only enter during the day to work. Further, Police spokesman Micky Rosenfield said that Palestinians returning to the West Bank would be searched for stolen property. Although, Palestinian/Israeli relations are extremely complex and heavily influenced by regional and religious dynamics, this newly implemented plan to segregate Palestinian passengers is eerily reminiscent of Jim Crow laws. The Jim Crow laws were state and local laws in the United States enacted between 1876 and 1965. They mandated de jure racial segregation in all public facilities in Southern states of the former Confederacy, with, starting in 1890, a "separate but equal" status for African Americans. The separation in practice led to conditions for African Americans that tended to be inferior to those provided for white Americans, systematizing a number of economic, educational and social disadvantages. De jure segregation mainly applied to the Southern United States. Human rights groups are fearful that Israeli police at the checkpoints in the West Bank will remove Palestinian passengers from the regular, non-segregated bus lines and order them to use the segregated bus lines, which could potentially inflame an already marginalized population. This newest legislation is incendiary at best, and racist at worst. It remains to be seen if this suppression will spur passive resistance such as demonstrated by Rosa Parks, who in 1955 refused to sit in the 'Blacks Only' section of the bus. Her resistance and subsequent arrest led to the Montgomery Bus Boycott, and was a pivotal moment in the American Civil Rights Movement. Though not a one-to-one comparison, nothing good can come from segregating people. Some people who read this post may believe that it is impossible for this to happen in 2010; however, I can attest to the veracity of one aspect of this story. Recently my mother attended a school sponsored event in Potomac, Maryland. Upon her arrival the hostess glanced at her and imperiously informed her that the kitchen was in the back. My mother with aplomb, informed the lady that she was attending the event on behalf of her grandson who was a student attending the school. Upon hearing this, the woman grudgingly accepted my mother's proffered hand before stepping aside to let her pass. As my mother entered, the woman wiped her hand on her dress. L'Shanah Tovah 5773 | Happy New Year 2012! Rosh Hashanah commences on Sunday evening, 16 September 2012. It is also known as Yom ha-Din (Day of Judgement), and begins the "Ten Days of Awe" (Yomin Noraim), the "Ten Days of Turning or Repentance" or "the High Holy Days" which conclude with Yom Kippur, the Day of Atonement. During this period, it is customary to greet one another with the phrase, "L'Shanah Tovah Tikateyvu" meaning "May you be inscribed in the Book of Life."